Fred Fry's Maritime Monday 104 with pictures of a Russian shipyard including a ship built for the Iranians and a host of links to amuse you until next Monday. Also visit gCaptain.com for more good nautical stuff. A must read at FbL's Disturbing, showing the effects of years of brainwashing about psycho veterans on the innocents who can't seem to keep in mind who the really dangerous people are. Xformed on USS Gary and the sailor for whom she was named here in Maritime Monday 39. Commander Salamander is revisiting the new Sea Service Maritime Strategy, as are Steeljaw Scribe and Galrahn at Information Dissemination. I, too, am working on a post in my usual Michener-esque plodding way ("first the earth cooled, then..."). Remember that Steeljaw had one of the men behind the drafting as a guest blogger and that the writers all come from different areas of expertise - I think it's a great way to examine what the new strategy means. And, trust me, it's not "inside baseball." Somehow I just don't think Pinch is fond of the Transportation Security Administration. War supports innovation. Among such innovations was the sea mine. Diana Schroeder's "The History of the Sea Mine and its Continued Importance in Today's Navy" (which can be found at the Naval Undersea Museum's website here) notes various forms of sea mines in an easy to digest writing. Early mines were designed such that they would explode on contact with the hull of a ship, or through a timing mechanism or through a "command" delivered from shore. Mines were traditionally placed by ships, submarines or from shore. Given their relatively low cost, they have proven to be remarkably effective weapons. The first recorded aerial minelaylng in combat occurred on November 20. 1939, when nine Heinkel 59 floatplanes flew to the Thames Estuary. Although five turned back due to navigation difficulties, four aircraft laid seven mines that night and thirty-four more in the following two days. 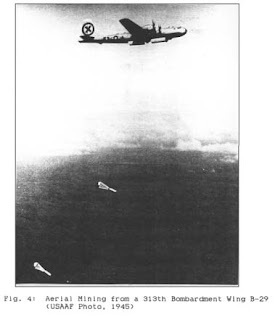 This aerial drop also lead to recovery of some unexploded mines with a new type of detonator, based on magnetism (see the images of the German sea mine which were found here) This, in turn, as noted here, led to use of degaussing to counteract magnetic mines. The British accomplished almost all allied mining in the European theater. The Royal Air Force (RAF) quickly adapted to the task, and Bomber Command laid 47,307 mines--eighty percent of the total offensive effort. In 1936, an officer in the Air Ministry had been the first to advance the idea of air--dropped magnetic mines. In 1939 that same airman commanded No.5 Group--the sole bomber unit charged with aerial minelaying. He was Arthur T. Harris, who quickly ensured all Bomber Command aircraft could carry mines once he became commander-in-chief in 1942. From the first few mines laid by his Handley Page Hampdens on April 13, 1940, Harris raised the number delivered to just over 1,000 in 1941, and then an average of 1,000 per month for the rest of the war. Bomber Command dropped mines along the Norwegian coast, in the Baltic Sea, Heligoland Bight, the Bay of Biscay, and the Mediterranean along the Italian-Sicilian coasts. As an example of tactical support, the RAF laid nearly 4,000 mines between April and June 1944 to prevent interference with the Normandy landings. The British also mined inland waterways, in particular the Kiel and Koenigsberg Canals, and the Danube River. Thus, the objectives of minelaying varied, from threatening warships and U-boats, to disrupting Germanys ability to import raw materials, transport supplies, or move troops. "Bomber" Harris went on to fame for his leadership in strategic bombing, though his role in mine warfare seems to be less well remembered, at least by Americans. For the effort, (about five percent of Bomber Command sorties), the RAF could eventually claim 762 Axis ships sunk and 196 damaged. (Altogether, British mines in the European theater totalled 260,000--mostly defensive--and ship losses from them numbered 1,590). In addition to sinking ships, the mines disrupted sea communication and blocked transportation on inland waterways. Another effect was tying up a large German minesweeping force, which comprised forty percent of all German Navy activity by 1945. 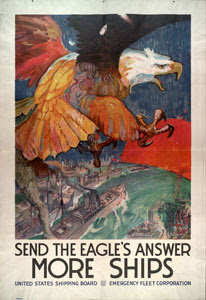 Southwest Pacific mining supported the strategic anti- shipping campaign by hindering the resupply of Japanese garrisons and the flow of resources to the home islands. In this theater the U.S. Seventh Fleet commander, Vice Admiral Thomas C. Kinkaid, directed the aerial mining almost exclusively conducted by the RAAF. His goal was to cause the most havoc possible given the limited number of mines and aircraft available. This caused him to disperse the effort, never saturating anyone port, but still hurting the Japanese in terms of ships lost and minesweeping required. Kinkaid had no doubts about the value of aerial mining. In a letter to the CNO in July 1944 he claimed, "Aerial mining operations were of the order of 100 times as destructive to the enemy as an equal number of bombing missions against land targets." 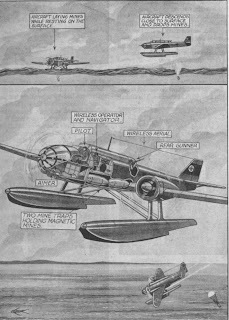 The PBY-5 Catalinas used by the RAAF were amphibious aircraft that provided good results. The aircraft was well suited to minelaying, with long range and a payload of 2,000-4,000 pounds. Out of 1,130 successful sorties that laid 2,498 mines, the Australians lost nine aircraft, a 0.8 percent loss rate. Altogether, the postwar U.S. Strategic Bombing Survey estimated these mines sank 90 ships total ling 250,000 tons, or approximately 40 percent of Japanese losses in the Netherlands East Indies. On August 10, 1944, fourteen B-29s laid their first mines on a mission from China Bay, Ceylon to the refineries at Palembang, Sumatra. The mines sank or damaged seven ships and closed the Moesi River entrance to tankers for a month. But what about the Navy? Carrier based TBF Avenger torpedo-bombers occasionally used mines to support anti-shipping air strikes and amphibious landings. When naval aircraft used mines, the objective was a direct, immediate and synergistic effect with another form of attack. TBFs of Carrier Task Force 58 made the first American carrier-based minelaying at Palau on March 30-31,1944. They trapped thirty-two ships inside the atoll by mining its passages, allowing aircraft to sink twenty-three with bombs and torpedoes and damage the rest. That action, and additional mining, led the Japanese to abandon Palau as a base. In short, the mines were used to "cork" the bottleneck port entrance and set up the follow on "ducks on a pond" missions. Of the approximately 13,000 mines laid in Japans "outer zone," aircraft dropped 9,254 from 3,231 sorties to create 108 minefields. Across this large area, aerial mining sank or damaged as many as 405 ships amounting to 776,260 tons at a cost of 40 Allied aircraft.6 Though difficult to measure, the Bombing Survey stressed, "Even more important was the fact that vita] shipping was greatly hampered in its movements and delayed for periods ranging from a day or two to a month. "7 After some ports were mined, such as Rangoon and Haiphong, large ships seldom visited them, while mines frequently closed numerous others, such as Shanghai, Hong Kong, Takao, Bangkok, Singapore, Balikpapan, and Surabaya. Mining a1so convinced the Japanese Navy to abandon anchorages at Pa1au, Penang, and Kavieng. The disruption of merchant traffic, in turn, caused supp1y problems for the Japanese Army deployed in China, Burma, Siam, Malaya and Indochina. The Bombing Survey specifically credited the mining of an in]and waterway, the Yangtze River, with having a blockading effect that significant]y hampered Japanese Army offensives in China during 1944-45.8 This action prompted the Survey to suggest: "The successes obtained helped prove the value of the aerial mine as an air force weapon." A mention of the psychological effect of sea mining by air during WWII can be found here. Early in the Vietnam war, many American military leaders advocated mining since most of the Norths military and economic assistance came by sea. In fact, a full 85 percent of the country’s imports passed through the sing1e port of Haiphong. In a postwar interview, Admiral Thomas H. Moorer said. "I think both the Johnson and Nixon administrations were about eight years late. I first recommended mining Haiphong in 1964 when I was Commander-in-Chief of the Pacific Fleet." Moorer added, "In my opinion, the failure to mine Haiphong immediately was the difference between winning and losing in Vietnam." l8 Due to the character of the war in Southeast Asia at that time (substantially a guerrilla war fought in the South), the efficacy of mining so early in Americas inv0lvement is questionable. 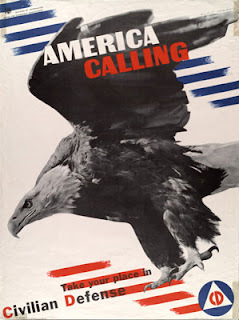 However, it was political restraint, motivated by the United States negative objective of preventing Soviet or Chinese intervention, that then prohibited a large-scale mining effort. In the spring of 1972, the North Vietnamese mounted a conventional invasion of the South by twelve divisions which proved highly vulnerable to air power. Meanwhile, the United States relations with the Soviets and Chinese had so improved that President Richard Nixon could direct the mining of North Vietnams ports without fear of intervention. After years of awaiting the order, carrier attack aircraft would now close Haiphong with mines. While the planes were airborne, the president announced that ships in port had three days to leave before the mines activated. Five elected to depart, but neither the 27 ships remaining, nor any from outside, challenged the minefield for the next nine months. Aircraft also mined other harbors, river entrances, and areas along the coast--against none of which could the North Vietnamese mount a serious minesweeping effort. The mines did not need to sink ships to be effective, since traffic through deep water ports fell from forty ships per month to zero. The mines were "on duty" twenty-four hours a day without unduly exposing friendly forces to hostile fire. Moreover, since mines were passive "weapons that wait," they facilitated a blockade without aggressive action toward the shipping of non-belligerent nations, which previously traded with North Vietnam. Ultimately, Navy aircraft laid 8,000 mines during the war, and by successfully blockading the harbors to external supplies; they helped thwart the 1972 Communist offensive. With this mine blockade and other bombing in support of the South Vietnamese forces, the North Vietnamese advance was halted, and peace talks resumed in July 1972. The concept of aerial mining lives on, including through use of stealth bombers. See here where the nearby illustration came from. More info here. As the war dragged on, President Lyndon Johnson escalated military action against North Vietnam, and in February 1967 allowed the Navy to mine five inland waterways (the Song Ca, Giang. Song Ma, Kien, and Cua Sot Rivers). The bombing campaign of Rolling Thunder begun in March 1965, had put pressure on the road and rail system and seemingly increased the importance of movement by barge and sampan. By April 1967, carrier-based A-6 aircraft laid the river minefields and caused the enemy to shift water-borne supplies back to already heavily burdened truck transport over jungle roadways at night. Still, the most lucrative targets--three main deep water ports (Haiphong, Hon Gai, and Cam Pha) remained off-limits to mines for another five years. THE moment marine engineer Fred Parle discovered his ship was under attack from pirates he feared he was "dead meat". In a scene which could have been straight out of 'Pirates of the Caribbean', heavily armed pirates used steel ladders and lines with hooks to board the 115-foot Svitzer Korsakov off the Somalian coast. But this was no Hollywood fiction. As the 67-year-old lay face down on the deck with his hands over his head, he did not think he was going to survive. "I lay there thinking we were all dead meat. I said a few prayers and left it to the man above," he said. The crew were ordered to take the ship down the African coast until they reached what the pirates deemed to be a safe spot in waters too shallow for a US warship which was keeping a watchful eye on proceedings. Thus began a 47-day ordeal which ended finally on St Patrick's Day when an undisclosed ransom was paid over. Interesting note about the pirate attempt to avoid the U.S.warships by driving to shallower water... Be nice to have some shallower draft vessels on hand to give them further concern. UPDATE: LA Times covers the pirates. 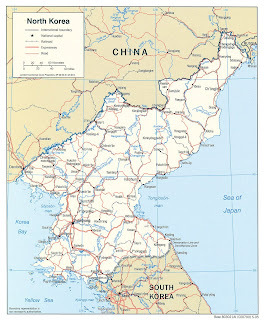 The North also warned against any "provocative actions" along its disputed western sea border with South Korea, the scene of bloody naval clashes in 1999 and 2002. The test-launches and warnings came one day after the North Korea expelled South Korean officials from a joint industrial estate, in protest at the new conservative Seoul government's tougher policy towards Pyongyang. Lingering flood damage, high commodity prices and political wrangling with the South could push impoverished North Korea this year into one of its worst food shortages since a famine in the 1990s, experts said. North Korea might make concessions on humanitarian issues in order to receive handouts from South Korea, but Pyongyang's leaders would try to keep any crisis on its farms from spilling over into international nuclear disarmament talks, they added. North Korea, which even with a good harvest still falls about 1 million tonnes, or around 20 percent, short of the food needed to feed its own people, relies heavily on aid from China, South Korea and UN aid agencies to make up the gap. "If the South and the global community fail to send food aid to the North, we might see a food crisis even worse than the one in the 90s," said Kwon Tae-jin, an expert on the North's agriculture sector at the South's Korea Rural Economic Institute. A famine in the mid-to-late 1990s killed more than 1 million North Koreans in a country of about 23 million. North Korea for years has been able to receive massive food aid with few questions asked by left-of-centre South Korean governments who have seen the handouts as a small price to pay to keep the peninsula stable. But a conservative government that took power in South Korea last month said there would no longer be a free ride for its capricious neighbour. North Korea's slow-moving government has not yet adjusted to the policy change, experts said. New President Lee Myung-bak wants to tie aid to progress his communist neighbour makes in nuclear disarmament, reuniting families separated by the 1950-53 Korean War and returning more than 1,000 South Korean citizens believed to be still held in the North. North Korea typically asks the South to provide it with about 300,000 tonnes of fertiliser for its spring planting as well as with 500,000 tonnes of rice. The North has been quiet this year. 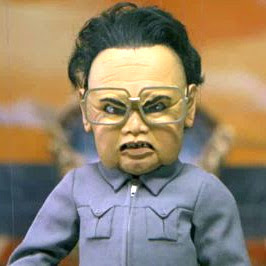 "North Korea has yet to ask for fertiliser aid most likely in fear of facing rejection from the South," Kwon said. Without the fertiliser, North Korea is almost certain to see a fall of several tens of tonnes in its harvest, Kwon said. The North will start to feel the shortage the hardest in the coming months when its meagre stocks of food, already depleted by flooding that hit the country last year, dry up and before the start of its potato harvest in June and July. Of course, as previously noted here, humanitarian food is being diverted to the North Korean military. Vice Admiral John G. Morgan, Jr, Deputy Chief of Naval Operations for Information,Plans and Strategy (N3/N5) met with some familiar bloggers (Galrahn, Steeljaw Scribe and Eagle1 among them)and answered questions about the new "Cooperative Strategy for 21st Century Seapower" which is available for your reading pleasure here. You can listen to the Roundtable st 03270818085220080327_ViceAdmMorgan_audio.mp3 (audio/mpeg Object). While thousands of injured soldiers were returning from combat, a Clayton man was bilking the government of more than $18,000 in claims for service-related injuries he never received, according to a federal jury in Virginia. Randall A. Moneymaker, 44, who also has said he lives in Roanoke, Va., was convicted Tuesday in Roanoke on federal charges that he defrauded the government by lying about his military service and submitting false documents to support the lies. Moneymaker's claims that he had seen combat in Iraq, Afghanistan, Bosnia, Panama, Grenada and other locations were refuted by the government, which produced tax returns for civilian jobs Moneymaker held during times he said he was out of the country. At one point, prosecutors argued in court that shrapnel scars Moneymaker claimed to have on his back were actually surgical scars from liposuction. "This defendant attempted to defraud the men and women who serve and protect our freedom," U.S. Attorney John L. Brownlee said after a jury found Moneymaker guilty. Brian McGinn, spokesman for Brownlee's office in western Virginia, said Moneymaker did serve in the reserves from 1981 to 1982, and he was on active duty in the Army from 1983 to 1985 before receiving a general discharge. McGinn said there was no evidence Moneymaker had ever left the country during his service or that he was injured. 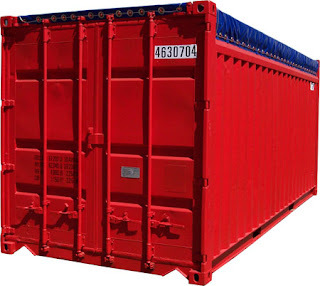 Shipping container shortage: It's the economy, silly! Container shortages are hammering US shippers as exports surge on the back of the falling dollar. US exports grew in 2007 by 16.6 percent year on year, the best since May 2004. "An exporter cannot get a container in the Midwest, and in Southern California he can't get space on a ship," said Peter Friedmann, executive director of the International Trade Counsel. Most of the export boxes from the US are stuffed with recyclable goods and agricultural products, and while the increase addresses the record trade surplus, the transpacific route has historically been geared for eastbound trade. "People are simply not able to export the sort of volumes of which they are capable of," Friedmann said. "Our answer to the trade surplus just can't be delivered." International Asset Systems (IAS) is an asset management solution provider based in Oakland, and its senior vice-president of US intermodal, Phil Behenna, explained that the box supply pattern was changing in the Midwest. "For the first time in living memory, there are many new markets for which the shipper cannot find boxes," he said. Behenna said out of every 100 containers coming into the US, about 50 would go back out empty. Of the remaining 50, most would have to be trucked back to the port empty while exports were found. Only five would get "turned on the street", or filled without having to be taken back to a port empty. "Usually the depot will send out another container to collect the export cargo, mainly because they have no idea where the empty containers are in time to re-route a truck," he said. But even if the containers can be found, there is no guarantee that space would be available on ships leaving the port complex of Los Angeles-Long Beach. Slot space was an issue of pricing, Friedmann said. "The carriers will have to adjust their pricing to guarantee space and their customers will have to understand they will pay more for the space," he said. "The demand for space by exporters is going to continue, so it will no longer be a surprise for the lines." Ed Zaninelli, vice-president of the transpacific westbound trade at Orient Overseas Container Lines, said exports may increase by 20 percent this year. Isn't it great how free markets work? 19.03.2008: 0312 UTC: 10:46.8N - 066:44.5E, Arabian sea. (SVITZER KORSAKOV) per 24 Feb 08 reporting. According to the article, Omar Shafdero, an employee at the Puntland Ministry of Finance, was arrested on 05 Feb 08 on the orders of Puntland President General Mohamud Adde Muse. The article cites sources close to the president as explaining that President Muse accused Shafdero of being closely associated to the group of pirates holding the hijacked tug. Shafdero was reportedly quickly released under mysterious circumstances with a source in Boosaaso suggesting corruption at all levels of power contributed to the release. The article goes on to state Puntland government officials recently issued several clauses intended to curb the disturbing rise in crime in the region. One clause said the government would implement the rulings of Islamic Law on pirates exposing them to the death penalty. Another clause expelled the head of the al Habeeb coastguard company after he reportedly refused to visit the location where the tug was being held hostage (LM: Garowe Online). GMT, approximately 60NM north of Caluula, Somalia. Two white hull speedboats approximately five meters long with five armed men in camouflage clothing approached the tanker while underway. The master raised the alarms, alerting the crew then ordered them to leave the deck. The tanker commenced evasive maneuvers and increased speed. 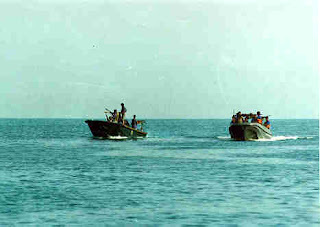 Men on one of the boats fired shots in the air, but soon moved away from the vessel. The crew continued to exercise vigilance and advised all vessels in the area regarding the incident (Operator, IMB). 5. GULF OF ADEN: Vessel reported suspicious approach 05 Mar 08 at 0824 local time/0524 UTC while underway in position 13:46.5N-049:24.5E, approximately 40NM off the coast of Yemen. The vessel was approached on its starboard side by four open skiffs, doing 17 and 18.5 kts. One skiff crossed the vessel’s bow at a distance of about five cables then kept the port side of the vessel. The next skiff tried to challenge the vessel with 18.5 kts in a course that was possibly intended to get alongside the vessel, finally turning to port and passing vessel’s stern at a distance of less than two cables. The third skiff passed the stern at a distance of about 3-4 cables. The fourth skiff tried to approach the vessel’s bow but the vessel carried out evasive maneuvers while increasing its speed, it crossed the bow at a distance of about two cables. After the vessel had passed the skiffs and it was clear that the skiffs could not get any closer, they soon reduced their speed and moved away. All the skiffs were Arabian open style boats, length about 8 to 10 or 12 meters with a sharp bow, and were probably wooden. They all had outboard engines. Two skiffs were mainly white, one with an orange hull, which had at least two engines, and one in multiple colors. Each craft had at least three persons, all in uniform-like clothed (Operator, IMB). 6. INDIAN OCEAN: Semi-submersible heavy lift ship reported suspicious approach 02 Mar 08 at 0237 UTC while underway in position 04:40.2N – 057:38.9E, 500NM off the coast of Somalia. While at a distance of 5NM, a drifting orange painted dhow with white stanchions and 25 persons onboard, called up the vessel requesting them to stop because they had no food or water. As the vessel altered its course, the master noticed that the dhow had increased its speed and was heading directly for them. Seeing this, the master suspected an attempted attack, altered course, and headed away from the dhow. The vessel and the dhow were both doing around 7kts and after about 3.5 hours, the dhow altered course towards Socotra Island. The same dhow was later heard calling another vessel to stop (Operator, IMB). 1. RED SEA: Tug reported suspicious approach 05 Mar 08, while underway in position 15:08N-042:14E, 40NM west of Al Hudaydah, Yemen. The suspicious craft traveling at a speed of 27kts, came from Jabal Zubayr Island towards the tug towing a crane barge. The suspicious craft had seven persons on board, some with camouflage suits and automatic weapons in their hands, possibly Kalashnikov and AK 47’s. They approached at a distance of 15 meters on the starboard side of the tug. They waved at the crew and called the vessel by its name many times on VHF ch. 16. The tug’s master visually indicated from the wheelhouse that he was aware of the speedboat’s presence but did not respond on VHF. The suspicious craft moved away and went back towards the direction of the island. The incident lasted approximately five minutes (Operator, IMB). Sri Lanka's navy has fought a battle with a flotilla of Tamil Tiger boats off the island's north-east coast. It comes days after officials said a navy fast-attack craft was sunk by a sea mine. The rebels claimed it was sunk by a suicide attack. The latest sea confrontation took place in the middle of the night. A navy patrol spotted a small flotilla of Tamil Tiger boats hugging the coast and opened fire. Navy spokesman Lt Cdr Rohan Joseph said one rebel vessel was disabled in the fighting but he had no details on whether anyone on board was wounded or killed. The use of sea mines by the Sea Tigers would be of interest to ships transiting the area, as Galrahn notes here, but for a variety of reasons, I tend to believe the Sea Tigers this time. ...the delineation point when we stopped attempting to do analysis and started to repackage intelligence reporting was shortly after Saddam’s regime fell to US and allied forces and it was noted that the road to Baghdad was not paved with artillery shells full of nerve agent. The fact that US intelligence analysts did their job – best conclusions drawn from incomplete, insufficient and occasionally inaccurate information – is lost in the midst of a grand blame-game. The response is typical bureaucratic short-sightedness mixed with a large dose of management philosophy of the moment: as long as we stick to re-packaging “facts” we can avoid being called “failures” in the future. The fundamental problem of course is that you can train monkeys to sort documents and stack them into neat piles; humans have more highly developed gray cells and should be applying them accordingly. Cited Rand report available for free from here. An American cargo ship under contract to the U.S. Navy opened fire on a small Egyptian boat while moving through the Suez Canal, the U.S. military said Tuesday in a statement. Egyptian authorities said at least one man was killed, but the U.S. said it had no reports of casualties. The Global Patriot, which was under short term charter to the navy's Military Sealift Command, entered the canal from the Red Sea at Suez after dark Monday when it was approached by several small boats, according to both U.S. and Egyptian officials. Small boats selling cigarettes and other products often swarm the civilian ships moving through the canal. These waterborne merchants know not to approach military vessels but the "Global Patriot" looked like a civilian vessel, said the security official, speaking on customary condition of anonymity. "We are very conscious of being in heavily trafficked areas and we as professional mariners try to keep people from getting too close," Fifth Fleet spokeswoman Cmdr. Lydia Robertson told The Associated Press by phone from Bahrain. "Our team did take the appropriate steps to take those measured steps to warn the vessels that were getting too close." Robertson, who noted that a Navy security team was on the vessel, said that the same rules of engagement applied for war ships as for those under contract. Egyptian officials confirmed that the ship was now continuing its journey through the canal and expected to arrive at Port Said near the Mediterranean by nightfall. The "Global Patriot" is registered to the New York-based Global Container Lines and, according to the company Web site, the vessel trades between the United States, the Red Sea, the Persian Gulf and the East Africa. The U.S. Navy is very careful about the activities of small boats near their war ships ever since the 2000 suicide attack by a motor boat on the U.S.S. Cole in Yemen killed 17 sailors. A U.S. Navy security team was aboard the cargo ship. "The boats were hailed and warned by a native Arabic speaker using a bullhorn to warn them to turn away. A warning flare was then fired," said a statement from the U.S. embassy in Cairo. "One small boat continued to approach the ship and received two sets of warning shots 20-30 yards in front of the bow." The statement added that "All shots were accounted for as they entered the water." It also said that "initial reports indicate that no casualties were sustained on either vessel." An Egyptian security official at the canal, however, said that after the warning shots, a man was shot dead in the small boat and that the three other men with him were wounded. Remember to take initial reports cautiously and wait for a full investigation. Global Container Lines website. Previous post on Embarked Security Teams. Pirates stole two World Food Programme boats that were anchored in southern Somali port town of Merca, officials said on Monday. "The two fiberglass boats were stolen at midnight (Sunday) and we don't exactly know who took them. They were used to train our staff members for emergency cases," a local WFP staffer told AFP. "None of our staff members was there at the time so they took the boats alone," from Merca, about 100 kilometres (63 miles) south of the lawless capital Mogadishu. The two fibreglass boats, stolen at midnight on Sunday midnight, found near the port, said WFP spokesman Peter Smerdon. "The two boats have been recovered about one kilometre from Merca town, but without their engines. We have launched an investigation and are attempting to recover the engines," Smerdon told AFP in Nairobi. Smerdon said it was unclear whether the boats had been stolen by ordinary criminals or pirates. I can answer that, Mr. Smerdon. Unless the boats were captured on the high seas (international waters), what you have is a sea crime, not piracy. Fred Fry has posted Maritime Monday 103 at gCaptain.com - a look at a Spanish shipping company and a week's worth of other worthwhile maritime links, including a link to a U.S. Coast Guard capture of a drug running near submarine here. Xformed's Monday Maritime Matters with the story of a brave chaplain and the ship named for him. Speaking of which, Galrahn finds a sea base off Libeia. John Rosenthal catches the U.S. Department assisting the Iranians here. "[W]e have lost control of the seas to a nation without a Navy, using pre-World War I weapons, laid by vessels that were utilized at the time of the birth of Christ." The UN command was fortunate that it did not have to deal with enemy minefields in the first critical months of the war, because the allied navies did not have adequate mine countermeasures resources. 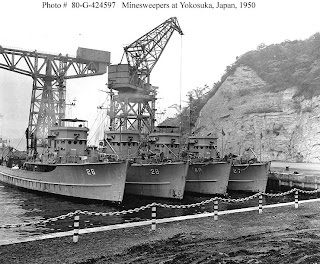 Owing to post-World War II demobilization and defense budget cuts, the wartime force of 500 mine warfare vessels, manned primarily by Naval Reserve sailors, had been reduced to a worldwide contingent of two destroyer minesweeper divisions, two fleet minesweeper divisions, and 21 smaller craft. During the postwar years the Navy devoted much more of its attention and resources to the development of new aircraft carriers, jet aircraft, and shipboard surface-to-air missile systems than mine warfare ships and equipment. ...[A]n armada of 250 warships and transports, the latter carrying 50,000 marines and soldiers of the U.S. X Corps, waited idly offshore as minesweepers worked to clear an approach route through waters containing over 3,000 mines laid with the direct assistance of Soviet advisors. On October 10, Captain Richard C. Spofford's Mine Squadron 3, warned by the helicopter crew from U.S. cruiser Worcester that mines were present in the waters off Wonsan, began their dangerous clearance mission. During that day and the next two, Spofford's nine vessels, helped by helicopter and PBM seaplane spotters, cleared a twelve-mile-long lane toward the landing site. The ships neutralized over 30 mines while the men of Underwater Demolition Team 3 marked another 50 mines for later destruction. In mid-morning of the 12th, however, minesweeper Pirate (NB Eagle1: Remarkable set of photos of Pirate hitting the mine and sinking can be found here) hit a mine and quickly sank, with six of her crewmen, and an hour later Pledge and six of her sailors met the same fate. Enemy shellfire from shore addded to the danger and difficulty of the operation. By the 18th, two days before the planned landing, the minesweeping force had almost cleared all moored contact mines from the approach lane to the beach. That day, however, magnetic influence mines destroyed ROKN YMS 516 and half of her crew. Discovery of these new weapons stalled the operation. Finally, on October 25th the way was clear for the X Corps to deploy ashore at Wonsan. The operation, however, would be a non-combat "administrative landing," since Republic of Korea ground units had liberated Wonsan on October 11. At one point Rear Admiral Allan Smith, in charge of the advance force at Wonsan, cabled the Navy's Washington headquarters that "we have lost control of the seas to a nation without a Navy, using pre-World War I weapons, laid by vessels that were utilized at the time of the birth of Christ." His words and the experience at Wonsan would engergize the Navy's mine warfare community. In the autumn of 1950, helos were used primarily for SAR, observation and VIP transport. On October 1, 1950, the wooden-hulled minesweeper Magpie was sunk by an anchored mine off the Korean coast. While searching for survivors HU- Is LT Swinburne photographed two moored mines. Two days later Aviation Pilot Chief B.D. Pennington, also from HU-1, sighted several moored mines in the Wonsan area. From that point onward, helos had a new mission, mine warfare. The Navy had ordered nearly all of its H03Ss from its two helo squadrons, HU- I (NB E1: HU-1 has a good historical website here)and HU-2, dispatched to Korea. Wonsan Harbor was the key mining area. If the sea wasn't rough, if the direction of the sun rays was right, if the water was clear, and if the pilot was wearing polaroid sun glasses, he could spot the mines from aloft rather easily. Aviation Chief Pilot R. Jenks and a maintenance crew of six from HU- I were temporarily attached to several ships during our eight-month Korean tour. We were on USS St. Paul (CA-73), USS Toledo (CA- 133), USS New Jersey (BB62), USS Essex CV-9) and several LST amphibious landing craft. The LSTs were "mother" ships providing fuel, fresh water and mine sweeping tackle to the smaller wooden minesweepers. They also served as a small aircraft carrier for helicopters. While aboard LST Q007 on May 6, 1951, the Senior Destroyer Commander radioed for our help. 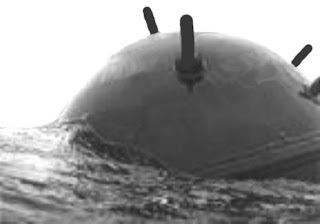 Two floating mines were sighted in the midst of his four anchored destroyers. The ships couldn't fire at them for fear of damaging each other. Aviation Mechanic Chief Slavin was our best rifleman so with our one and only Garand 30 caliber weapon he and I went hunting. As I hovered the H03S a safe slant range away, Chief Slavin shot and sank one of the mines. (In mine warfare school we learned that horned sea mines have an unactivated wet cell battery. When a horn is broken, by contacting a ship or from concusision, water enters the battery. Water mixes with acid and activates the battery, thus creating an electric charge which detonates the mine's explosives. If a mine's casing is penetrated, without breaking a horn, it fills with water which soaks the explosives and sinks without detonation.) He then fired repeatedly at the second mine until he ran out of ammunition. We dispensed dye marker to mark the spot, flew back to St. Paul for more ammo, and returned to the scene. Chief Slavin fired many times again at the mine, without result. I know damn well you're hitting that son of a gun' " I shouted, "Let's take a closer look." I eased the bird forward toward the mine and suddenly, with all his strength, the Chief yanked my shoulder back. "It's boiling," he cried. I stopped in time as the mine exploded, raising a column of water 200 feet high. Seconds later, six more underwater mines exploded, presumably from the concussion of the first one. One of the six was directly below the HOS3 and although it created a great upheaval of water, it didn't harm us except we felt the concussion. We painted eight more mines on the side of our chopper that day. As a result of this and similar successes, it was recommended that helos be used in future eradication of floating mines: Our unit had shot and sunk two more mines when, unfortunately, a dispatch from higher authority was issued to all Naval Forces Far East. It said, "Helicopters will not (repeat) will not attempt to destroy mines in the future." The powers above apparently didn't want aircraft shot down by a mine. Thereafter, we assisted the minesweepers by dropping dye marker on the mines we sighted which were in the path of the minesweeper formations. 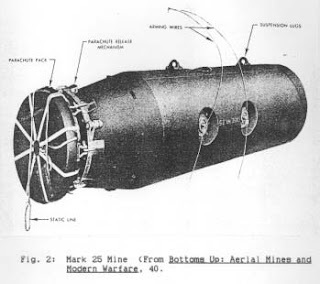 The concept of Airborne Mine Countermeasures (AMCM) was initiated by the Bureau of Aeronautics in 1951, and research and development (R&D) to exploit the capability of the helicopter to participate in MCM operations was significantly expanded. This R&D effort in AMCM continued throughout the Korean and Vietnam conflicts as various helicopters were examined for suitability in the MCM role. 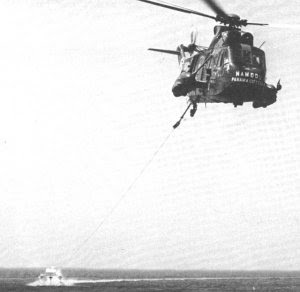 Towed moored, magnetic, and acoustic sweep equipment was also developed specifically for the helicopter. In 1952, Piasecki HRP-1 flying banana's were tested in Panama city to demonstrate their potential as minesweepers. VX-1, the Navy test squadron at Key West, Florida, also tested Piasecki's new minesweeping equipment aboard the HRP-1. In order to reduce weight on these underpowered helicopters, the fabric skin of the aircraft was removed, and large donut shaped flotation inner tubes were attached to the remaining framework. 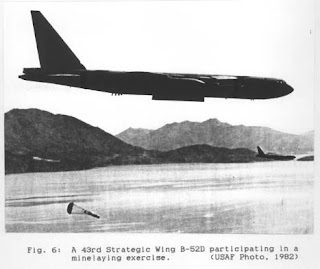 The minesweeping trials were fairly successful, even though the aircraft looked quite ridiculous. In 1962, the Chief of Naval operations directed helicopters be converted for MCM development, training and eventual operational deployment. The twin-turbine, tandem rotor Boeing-Vertol HRB-1 or RH-46A was the aircraft of choice. Unfortunately, the U.S. Marine Corps (USMC) had more urgent need for the H-46's, so the Navy turned to the Sikorsky HSS-2, renamed SH-3A Sea King. In 1964, Sikorsky began converting nine SH-3A's to RH-3A's for AMCM. Admiral Zumwalt, Chief of Naval Operations, began Project 60 in 1970. This project was the use of Airborne Mine Countermeasures as the principal means of clearing mines, based upon the sensitivity and sophistication of modern mines which precluded the use of surface minesweeping. The RH-53D Sea Stallion, a version of the CH-53A Sea Stallion was the selected successor as the AMCM platform. However, in an interim measure, the first AMCM squadron, HM-12 Sea Dragons, was formed in April, 1971 using fifteen CH-53A's borrowed from the USMC. As was the RH-3A, the CH-53A was similarly upgraded with AMCM specific enhancements. To counter this threat the Navy has developed the Airborne Mine Countermeasures (AMCM) program which transfers the surface mine clearance or countermeasures operation to an airborne platform, specifically the helicopter. The helicopter tows various devices thru the water of a minefield. These devices in turn cause the magnetic influenced mine and the acoustic mine to detonate in place. In the case of the moored contact mine, the device cuts it from its anchor allowing the mine to rise to the surface where it is detonated by small arms fire... Concurrent with the development of the mine countermeasures helicopter has been the attainment of a world-wide quick reaction capability. RH-53D or CH-53D helicopters, AMCM tow systems, and support personnel can be rapidly airlifted by C-5A to specific strategic areas considerably faster than previous surface mine warfare forces could deploy. In April 1971, a helicopter squadron, Helicopter Mine Countermeasures Squadron Twelve (HM-12), was commissioned at Norfolk, Virginia, and tasked with a primary mission of worldwide AMCM. The squadron functions under the operational control of Commander, Mine Warfare Force, Charleston, South Carolina. Initially, HM-12 was equipped with CH-53A's on loan from the Marine Corps. The helicopters were brought up to CH-53D specifications by Sikorsky Aircraft Corporation prior to commencing AMCM operations. The squadron is now equipped with the RH-53D, the primary minesweeping helicopter. As that article indicates, on occasion, Marine H-53s were pressed into countermine operations. A description of sweep operations is also LtCol Northwick's article. The Navy had designed a new larger hydrofoil sled, the MK-166, and realized that even the RH-53D was underpowered to tow it. So in 1982, Sikorsky was awarded a contract to develop a new minesweeper, the MH-53E Sea Dragon. Based on the CH-53E Super Stallion, the first prototype of this three engine, seven bladed MH-53E helicopter was in fact a conversion CH-53E. It first flew in September 1983, and the first production aircraft was delivered to HM-12 in April 1987. It was decided that HM-16 would be disestablished in 1987, and key personnel would be taken to form HM-15 in Alameda, California, the first operational MH-53E squadron. The Naval Reserve received the RH-53D's displaced by the MH-53E's and formed two reserve AMCM squadrons, HM-18 in 1986 and HM-19 in 1989. Though the MK-166 sled was abandoned, the Sea Dragon has proven to be a valuable and powerful AMCM platform. 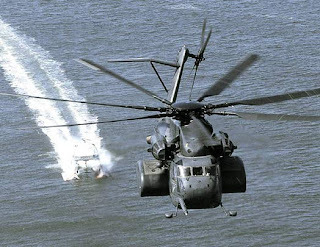 Rated at 25,000lb maximum tow tension, the MH-53E eclipses the RH-53D (15,000lbs) and RH-3A (a mere 8,000lbs). During Operation Desert Shield, HM-14 deployed six aircraft aboard USS TRIPOLI, then moving to USS NEW ORLEANS and USS LA SALLE. Most of the minesweeping missions in the gulf were MK-103 cutter arrays and MK-106 magnetic/acoustic sweeps. Toward the end of Operation Desert Storm the AN/AQS-14 sonar was successfully employed. During this period the helicopters also upgraded to Global Positioning System receivers for minefield navigation. Prior to this, the crews had to depend on less acurate and more complicated systems to determine their position in the minefield. The MH-53E's were usually trailed by SH-3 Sea Kings, SH-60 Seahawks, or UH-1N Twin Hueys which acted as mine spotters and carried Explosive Ordinance Disposal divers. AH-1J Cobras provided air fire support since the Sea Dragons have no armament (other than small .50 caliber machine guns) and have limited manueverability under tow. Following Desert Storm, both AMCM squadrons (HM-14 and HM-15) went from 12 to 8 MH-53E aircraft, and the Naval Reserve squadrons upgraded from the RH-53D to the MH-53E. In 1992 the Commander, Mine Warfare Command assumed operational command of the AMCM squadrons. In 1994 and 1995, the Reserve AMCM squadrons were disestablished while Naval Reserve personnel and aircraft merged with the active duty squadrons to form two 12 aircraft integrated squadrons. In 1997, the USS INCHON (MCS-12)became operational as the Mine Countermeasures Command and Support ship. The HM squadrons received a dedicated platform from which they could launch AMCM missions from the sea. Although the service has not yet designated which carriers will receive the countermine equipment, planners expect forward-deployed helicopter sea combat squadrons with Sikorsky Knighthawks to replace dedicated helicopter mine countermeasures squadrons flying the MH-53E Sea Dragon. It takes 72 hours to airlift the big Sea Dragons and their minesweeping equipment to a combat theater. Multi-mission Knighthawks routinely operate from ships of many types. "The beauty of the organic construct is that they're already in theater," observes Capt. James Rennie, the mine warfare branch head in the Expeditionary Warfare Directorate of the chief of naval operations. The Navy will put new detection and neutralization technology on surface ships, submarines and aircraft. Seven new organic mine countermeasure programs are in development, five of which are helicopter based. The mine countermeasures console interfaces with sensors and with the GPS-assisted inertial navigator in the helicopter. It has a single large display that shows multiple views for each sensor and a smaller navigation display identical to those in the Knighthawk cockpit. According to Lockheed Martin director of multi-mission helicopter programs, Paul Monseur, “It’s one console for all sensors, one common look and feel for all of them.” Much of the console hardware is shared with the MH-60S/R common cockpit to facilitate maintenance, support and upgrades. Block A systems operational on the Knighthawk in 2005 include the Raytheon AN/AQS-20 mine-hunting sonar and the Northrop Grumman Airborne Laser Mine Detection System (ALMDS). The towed AQS-20 fish uses multiple sonars to scan large volumes of ocean quickly, and has an electro-optical imaging capability to detect and classify mines in one pass. ALMDS uses an aircraft-mounted LIDAR (light detection and ranging) sensor to detect floating mines and moored mines down to the keel depth of ships. The common cockpit displays of the MH-60S and MH-60R remain unchanged, but additional software gives minesweeping crews tow tension and skew indicators. Mission plans generated aboard the ship will be downloaded into the aircraft on PCMCIA cards. Lockheed Martin received a contract in September 2003 to develop organic mine countermeasure systems on the MH-60S. The Block B capability in 2007 introduces the AN/AQS-232 AMNS (Airborne Mine Neutralization System) and RAMICS (the Rapid Airborne Mine Clearance System). The AN/ALQ-220 OASIS (the Organic Airborne and Surface Influence Sweep system) follows in 2008. Derived from the German Seafox shipboard mine-neutralization system, the AMNS enables the MH-60S to relocate, identify and neutralize mines previously found by AQS-20 sonar, the ALMDS laser detector or other mine warfare platforms. The hovering helicopter deploys an expendable, self-propelled neutralizer steered to the suspected mine by the MH-60S operator. Sonar and video displays on the airborne console help identify a potential mine threat. Confirmed mines are destroyed or detonated with a shaped charge. The RAMICS uses a laser-aimed 30 mm Bushmaster II cannon to neutralize near-surface, floating and shallow-bottom mines. The blue-green laser penetrates the water to target the mine for the stabilized, rapid-fire gun. Flat-nosed, super cavitating projectiles are designed to enhance range, speed and accuracy when entering the water. The high-velocity rounds penetrate the mine case and detonate the mine with a reactive charge. 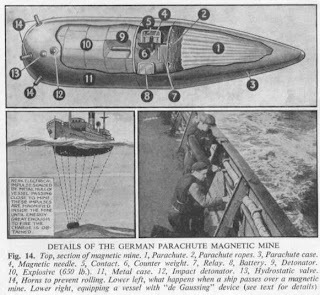 The OASIS combines the acoustic and magnetic mine detonation functions now performed by noisemakers and magnetic sleds in a single towed body. Deployed from the helicopter, it emulates ship signatures in shallow water at speeds up to 40 knots. Countermine missions nevertheless will make additional demands on HSC crews. Today’s dedicated mine-warfare squadrons emphasize crew coordination and specialized pilot training. Air taxiing through sliding turns low above the water with minesweeping gear in tow takes practice. More responsive, less-costly organic systems put additional demands on the MH-60S helicopter. Towing minesweeping gear inevitably takes a toll on aircraft. Mine countermeasures add about 300 pounds to the empty weight of the MH-60S, compromising performance in cargo and other roles. Sikorsky is studying weight reduction options, including composite stabilizers and lightweight crew seats. With around 6,000 pounds sustained and 9,000 pounds peak tow tension and a comparatively small cabin, the MH-60S cannot use the Mk 105 sled or Mk 103 cutter array deployed with the MH-53E. However, OASIS, RAMICS and AMNS should provide operational commanders with new capabilities, and eliminate the need for explosive ordnance disposal divers to deal with mines cut loose by mechanical cutters. “It’s our intent to deploy a capability equal to or greater than the -53 capability,” says Rennie. The MH-60S helicopter, in AMCM configuration, is equipped with five mine-hunting systems: AN/AQS-20 sonar, acoustic/magnetic minesweeper, remotely piloted anti-mine torpedoes, mine-detecting laser and 30mm mine-detonating cannon. Airborne mine sweeping has come some distance from that early effort spawned by a couple of photos taken by a helo pilot off Korea. Let's salute the pioneers and the brave men who tow the sleds behind their aircraft, saving lives through their efforts. Let's hope we don't have to relive the painful times that gave rise to Admiral Smith's words that started this bit of history. More information on Airborne Mine Countermeasures at Airborne Mine Countermeasures Website. The first American convoy operation commenced on July 22, 1987, when the 440,000 DWT crude oil tanker Bridgeton and the 46,000 DWT LPG (Liquid Propane Gas) tanker Gas Prince got underway in the Gulf of Oman and set course for Kuwait. The two recent additions to the American merchant fleet were escorted by the cruiser USS Fox (CG-33) and the guided missile destroyer USS Kidd (DDG-993). The small American convoy was supported by additional naval vessels positioned at the both ends of the Strait of Hormuz and off of Qatar.223 The USS Constellation (CV-64) battlegroup was stationed in the Gulf of Oman to provide aerial support. Saudi and American AWACS aircraft provided additional airborne surveillance over the Persian Gulf. miles west of Farsi Island, Bridgeton struck a moored mine. The mine damaged two forward cargo tanks, but did not result in any personnel injuries and the ship proceeded under her own power for Kuwait, with the thin-skinned U.S. Navy combatants trailing behind in an attempt to avoid sharing Bridgeton’s fate. Iran denied responsibility for the attack, claiming the “hand of God” had holed the tanker. In fact, Iran had sown at least sixty mines in three areas. The mining of M.V. Bridgeton demonstrated American unpreparedness to combat the mine threat and, more importantly, exposed the fatuity of the assumption that Iran could be deterred from directly confronting the United States. Following the July 24 mining of M.V. Bridgeton Admiral Crowe ordered a halt to convoy operations until sufficient mine countermeasures platforms could be put into place. The United States Navy was forced to activate several 1950s-vintage Aggressive class minesweepers from the reserve fleet. As it would take time to tow the 30 year old wooden vessels from their stateside homeports to the Persian Gulf, an interim solution was required. The next major confrontation occurred on the night of September 21, 1987. 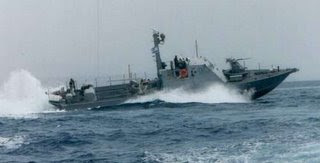 Army special operations helicopters operating from USS Jarret (FFG-33) discovered the Iranian naval vessel Iran Ajr laying mines off Bahrain in an area used as an anchorage by Earnest Will convoys. The American helicopters attacked the small vessel with machine gun fire, forcing the Iranian crew to jump overboard. A United States Navy SEAL team boarded the vessel at first light and discovered nine mines on the vessel’s deck, as well as a logbook revealing areas where previous minefields had been set. Surviving Iranian crew members were repatriated and Iran Ajr was eventually scuttled. n June 1984, HM-14 took delivery of the AQS-14 Mine Hunting Sonar and established the fleet's first operational airborne mine hunting capability. In August 1984, the squadron responded to a JCS directed rapid deployment order in support of operation "Intense Look" to conduct split site airborne mine countermeasures operations in the Gulf of Suez in support of the Egyptian Government, and in the Red Sea in support of the Saudi Arabian Government. During these operations the squadron earned the Navy Unit Commendation. In August 1987, the squadron executed another JCS directed rapid deployment order operating off the USS GUADALCANAL (LPH-7) and USS OKINAWA (LPH-3) in the Arabian Gulf as part of operation "Earnest Will." 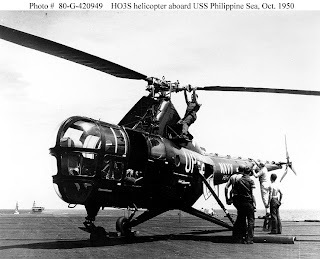 During these operations, HM-14 was credited with the first live moored mines swept by a U.S. Navy unit since the Korean Conflict. As a result of superb performance in the hostile and extremely demanding environment of the Arabian Gulf, HM-14 received the Navy Unit Commendation and the Armed Forces Expeditionary Medal. The book No Higher Honor by Bradley Peniston, tells the tale of USS Samuel B. Roberts taking a mine hit and her crew's heroic fight to save their ship. MINE WARFARE. DESERT STORM again illustrated the challenge of mine countermeasures (MCM) and how quickly mines can become a concern. Because of the difficulty of locating and neutralizing mines, we cannot afford to give the minelayer free rein. Future rules of engagement and doctrine should provide for offensive operations to prevent the laying of mines in international waters. Our Cold War focus on the Soviet threat fostered reliance on our overseas allies for mine countermeasures in forward areas. The MCM assets of our allies--- on whom we have relied for MCM support in NATO contingencies for years --proved their mettle in the Gulf, both in Operation EARNEST WILL (during the Iran-Iraq war) and DESERT STORM. Both operations highlighted the need for a robust, deployable U.S. Navy MCM capability. We are undertaking a comprehensive review of both our mine countermeasures strategy and the readiness of our forces to ensure our ability to conduct independent mine countermeasures operations when required. Some have argued that mine warfare is not a popular career path because it is too damn hard. CDR Salamander: Fullbore Friday looks at a German raider loose in the Indian Ocean and notes that one of her victims has finally been located. Pinch has fun with a conspiracy idiot, um, theorist. John of Argghhh!!! finds us a hero. Chap links to a underice adventure that probably caused all the sweat pumps to come on line. GI Korea shows the DPRK Army (North Korean Army) getting fed- by humanitarian food aid meant for the other starving masses. Is anyone still fooled by the DPRK? A Via ticket agent suspicious of the behaviour of four men who turned out to be stowaways called a Canada Border Services Agency tip line on Sunday, but was told the agency couldn’t act without more information. In Sunday’s case, the four stowaways travelled across the Atlantic Ocean hidden in a bus on a container ship and then sprinted away from a single commissionaire staffing the entrance of the Cerescorp container terminal in Halifax. The four men, believed to be Algerian, then made their way to the Via Rail station in Halifax, where they offered to pay more than the listed price for tickets. They also wanted to buy the tickets using European currency. "Their insistence on using either euros or French currency . . . and their willingness to pay in excess of the actual fare was certainly a red flag," Cox wrote to Kenny. "I tried to contact the special unit of the RCMP, but there was no answer. I then called the 800 number for Border Services and, in turn, the suspicious-activity hotline. I spoke to a woman there and, incredibly, she told me that it was not within their jurisdiction to act without names or more information." Cox’s e-mail says he contacted the RCMP’s Tantallon detachment and informed them the men were on their way to Halifax Stanfield International Airport to convert currency and that they intended to continue on to Truro — about an hour from Halifax by car — to catch a train. The men got to Truro in a taxi and were captured by town police before boarding a train. "They could have foregone the train and gone in any direction," he wrote. "This, as it turns out, was a lucky catch and was made in spite of Border Services." anada needs a dedicated national police force to deal with incidents like the four stowaways who slipped into Halifax on Sunday, says the former chief of the city’s ports police. The men, believed to be from Algeria, travelled across the Atlantic Ocean hidden in a bus on a container ship and then sprinted away from the commissionaire staffing the entrance of the Cerescorp container terminal in Fairview. Authorities eventually caught the foursome about five hours later in Truro as they prepared to board a train. "Right now, they throw a lot of publicity at it and they say the system’s working well and they got these guys," said Bruce Brine, who headed the Halifax ports police more than a decade ago. "And I can appreciate that. They’re police executives and they have to maintain a positive public image. But basically, we’re wide open and this incident the other day just shows it. "They were just illegals trying to get in. If they were actually organized, they would have been more covert. ""What it amounts to is anybody who wants to get into the country illegally can." "Let’s say an American cruise ship comes in and something happens, somebody gets at it because there’s no waterside security and the thing’s blown up and we have hundreds of people killed. Who is going to get sued?" It would probably take a major terrorist attack in a Canadian port to revive the ports police, said Mike Toddington, executive director of the International Association of Airport and Seaport Police. "Had the port police been around at the time of 9-11, there would have been absolutely no consideration of getting rid of the port police," said Mr. Toddington, who used to head the Vancouver ports police. Mr. Brine said he has talked to some of his former waterfront contacts about how the four stowaways were acting Sunday at Cerescorp. "I understand it was quite comical because, basically, even people were pointing at the gates where they could exit when they were running around like chickens with their heads cut off," he said. "I’ve spoken to one person who said it was totally ludicrous because there’s nobody on-site (to deal with stowaways)." The commissionaire who tried to stop them isn’t supposed to be a security guard, said Murray Lee, chief executive officer of Commissionaires Nova Scotia. He’s meant to check trucks and trains coming into Ceresport, Mr. Lee said. "We’re not harbour police; we don’t do security down in the docks," he said. "What we do is control access into the facility." 12.03.2008: 1250LT: Enroute from Calabar to Port Harcourt, Nigeria. Armed pirates, in three speedboats boarded a tug, underway, kidnapped six Nigerian nationals and took them ashore. The kidnappers are demanding a ransom for the safe release of the hostages. The kidnappers claim to be the ‘protectors of the Bonny River’. The Marine police unit attached to Cross River State Police Command has retrieved over 2,200 litres of stolen oil from pirates operating in the area. 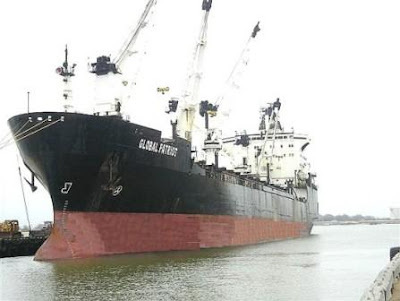 The pirates who were suspected to be an illegal business trip, shuttling between Nigeria and Cameroon, bunkering oil, reportedly escaped into the creeks along the Calabar River, and this time, the marine police was on their heels. The Police Public Relations Officer of the Command, ASP, Tom Adama Okpene, who linked the pirates to the spate of petroleum pipeline vandalisation in the area, said “our men are on their trail, and I can assure the public that very soon, the pirates and their accomplices will be arrested”. Consequently, the pirates were intercepted and the boat with which they were conveying the stolen oil was arrested, even as the pirates plunged into the sea, leaving their loot behind. It was gathered that the boat was arrested in the early hours of the morning as the pirates were allegedly heading towards the Republic of Cameroun. The boat, fitted with a 40 HP engine was arrested near petroleum pipelines that run from the jetty to the NNPC depot in Calabar. According to the Police, the pirates allegedly connived with some petroleum pipeline vandals resident in the state capital, to break the pipes along the Ekorinim axis of the Calabar metropolis. The PPRO said the boat was apprehended at about 3am, “ as the pirates who sighted the marine patrol team, suddenly abandoned the boat and dived into the sea”. Continuing, he said, “as the pirates sighted the marine policemen, they suddenly abandoned the boat, took a plunge into the sea and escaped into the creeks”. The boat has been impounded at the marina police station in Calabar. Inside the boat were over 100 containers, which included sixteen large drums of 100 litres each, about 50 jerry cans of 75 litres content each as well as many other containers, including empty ones. A fierce gun battle was reported, yesterday, between naval men of the JTF in the Niger Delta and suspected sea pirates along the Bonny Channel in Rivers State . The source disclosed that the soldiers were sailing in a gunboat when “they suddenly ran into the heavily armed gunmen in two engine boats” speeding towards the gunboat. Not much "spin" by the government forces? Nigeria has seen a massive rise in pirate attacks in recent weeks, with officials linking the upsurge to a general decline in security throughout the country's oil-rich Niger Delta region. While piracy has long been a problem off the coast of Somalia in East Africa, the recent attacks here in West Africa mark a new trend that could further cripple the economy of one of the world's poorest regions. "Before, it was maybe one death every two months or once in a fortnight, but five deaths in five different locations and five different companies?" says Paul Kirubakaran, managing director of the Seabless fishing company, whose boats are among the 200 shrimp and fishing vessels docked in Nigeria's commercial capital since a strike began in January. "When people are killed like this how can we ask them to go back [to sea]?" Trawler fishermen in the area suffered more than 100 pirate attacks in 2007, and a spike of 50 attacks in the first month of 2008 that culminated in five crew deaths in one day, maritime officials say. n February, the US Navy ran a maritime surveillance exercise for members of the Nigerian Navy and Air Force to tackle illegal operations, including piracy, in Nigerian waters. The US receives about one-fifth of its oil imports from the Gulf of Guinea, which includes Nigerian territorial waters, and the US Navy has been increasing its presence in the region for several years, according to the US State Department. The Nigerian government has set up a special subcommittee to find a solution to the pirate problem and says it will add 15 patrol boats. "The government has put additional security in place but has not detailed some of those measures," says Yemi Nelson, the assistant director of press in the Ministry of Agriculture, which covers fisheries. However, many Nigerian pirates are frequently better equipped than some Naval patrols. The pirates use machine-gun mounted speedboats and carry semi-automatic machine guns. They use hand-held radios so several boats can stage coordinated attacks. They pride themselves on having something of a military flair, often wearing military camouflage or giving their leaders titles like "General." Scene 1: How the staff views its pending visit to a ship. Scene 2: How the ship views the pending staff visit. Somali pirates released a Danish-owned tugboat that was held for more than a month after a ransom was paid, local officials said Tuesday. The British captain, Irish engineer and four Russian crew aboard the Svitzer Korsakov are "safe and healthy," said Ahmed Said Aw-Nur, the fisheries and ports minister in Puntland,a semiautonomous region of northeast Somalia. Aw-Nur told The Associated Press that the ship was freed after its Danish owner "negotiated with the criminals and paid hundreds of thousands of dollars for ransom." A regional official, who asked that his name not be used because he was not authorized to speak to the media, said US$700,000 (about €440,000) was paid. Aw-Nur condemned the paying of ransom "because it can encourage more piracy." Aw-Nur is right, but the lame reaction of Puntland's "government" doesn't help either...related posts here and at the links therein. If Puntland wants to stop pirates, they need to do it from the shore side. UPDATE: BBC reports "anger" at ransom. Owner confirms release. 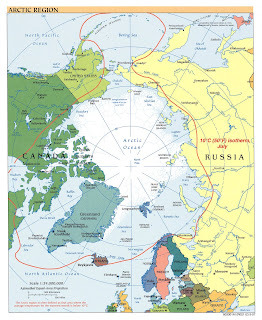 The U.S. Coast Guard says it's stepped up surveillance flights to the Arctic. It plans to complete one every two weeks to familiarize crews with the terrain. A flight last week, called the Arctic Domain Awareness, also provided training for crew on the C-130 cargo plane. Rear Adm. Gene Brooks, commander of the 17th Coast Guard District, said the Guard needs to know about the lay of the land and what other nations might be doing in the Arctic. During one of the flights, which began last fall, Brooks said the Coast Guard was surprised to come upon Chinese research vessels. Coast Guard officials on both sides of the St. Clair River are concerned vessels bound for Lake Huron may become stuck in ice as the shipping season resumes in coming days. 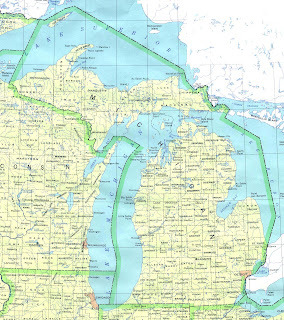 The official start of the shipping season is this week, with the lower St. Lawrence River locks opening Thursday and the Soo Locks opening March 25. Sam Babisky, superintendent of operations for the Sarnia Coast Guard, said there's still a lot of ice in the narrow shipping channel known as the Huron Cut, which begins north of the St. Clair River. "That ice there is blown off the shore," Babisky said. "There's hundreds if not thousands of square miles of the ice pack." No word if officials have called Al Gore to come up and blow hot air on the ice. Back to the basics: "A Primer on Oil Prices"
Sunday Ship History: Behold the Barrage Balloon!